The Bridge of Sighs, known as the Ponte dei Sospiri in Italian, is one of the most famous bridges not just in Venice, but in the world. The bridge passes over the Rio di Palazzo and connects the Dogi's Palace to the Prigioni, the prisons that were built across the canal in the late 16th century. But where does its name come from, and why has this bridge become a symbol of romance in the modern era? Antonio Contino designed and built the Bridge of Sighs in 1600. Though highly ornamental, built of white limestone with lattice-like screens covering two small rectangular windows, the footbridge served a very practical purpose. It was used to lead prisoners from the examining rooms to their cells in the Prigioni. Legend has it that prisoners who crossed the bridge on the way to their prison cells or the execution chamber would sigh as they caught their last glimpses of Venice through the tiny windows. The bridge and its unforgettable name became particularly famous after Romantic poet Lord Byron referenced it in his 1812 book "Childe Harold's Pilgrimage": "I stood in Venice, on the Bridge of Sighs; a palace and a prison on each hand." The legend of the bridge, while well known, is incorrect: Once someone is on the Bridge of Sighs, very little of Venice is visible from one end to the other. It's more plausible that the "sighs" were the prisoners' last breaths in the free world because once in Dogi, there was little hope of ever being released. To further challenge the legend, most historical accounts suggest that only low-level criminals were kept in the Prigioni, and the bridge wasn't even built until the Renaissance era in Italy, which was well after inquisitions had become a thing of the past. 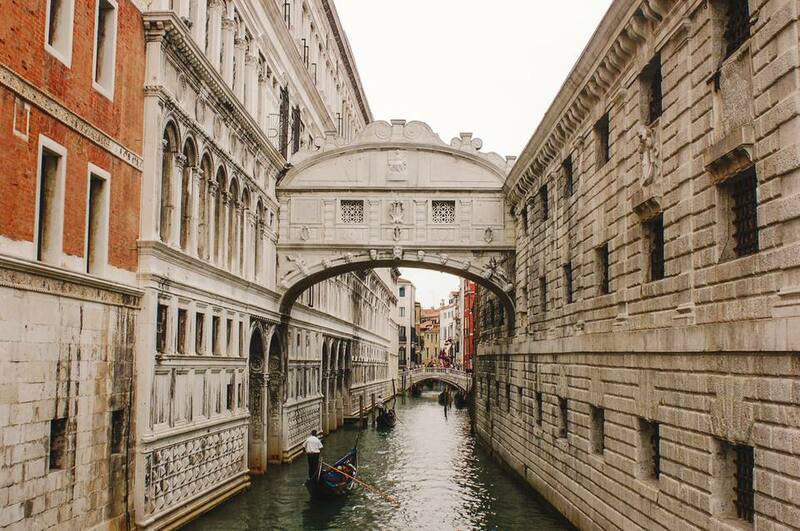 The Bridge of Sighs has become a symbol of love in a city that drips with romance. Access to the Bridge of Sighs is available only through booking the Itinerari Segreti, the Secret Itineraries tour. You may also get a closer look at its exterior by taking a gondola tour. And if you want to be especially romantic, take that gondola tour with your beloved. It's said that if a couple in a gondola kisses as they pass under the bridge at sunset as the bells of St. Mark's toll, their love will last forever. In addition to motivating many romantic gestures, the Bridge of Sighs also has inspired many architects, including American Henry Hobson Richardson, known for his "Richardson Romanesque" style. When he began designing Allegheny County Courthouse in Pittsburgh in 1883, Richardson created a replica of the Bridge of Sighs which connected the courthouse to the Allegheny County Jail. At one time prisoners were indeed transported across this footbridge, but the county jail moved to a separate building in 1995. Pittsburgh is second only to Venice in the number of bridges within city limits, so it's fitting that Richardson's greatest work (by his own estimation) emulates the most famous landmark in the Italian city.